After a half-decade of wallowing in consumer indifference, Microsoft has finally decided to pull the plug on the Zune. When the Zune media player rolled out in 2006, Robbie Bach said Microsoft intended to sink "hundreds of millions" of dollars into it over the next three to five years in order to break Apple's iPod-powered stranglehold on the market. "We can beat them," CEO Steve Ballmer said in November of that year, "but it won't be easy." But the Zune never found traction with the buying public and quickly developed a reputation best summarized by Late Late Show host Craig Ferguson, who said, "The Zune has all the features of the iPod except it's not as good." And now Microsoft has finally decided that enough is enough; no new versions of the much-maligned media player will be released. Zune isn't entirely dead, however. Existing models will remain on the market and the Zune software will continue to be developed and incorporated into Windows-based mobile phones. "We are thrilled by the consumer excitement for Zune across many new platforms, including Windows Phone 7 and Xbox 360," the company said in a statement. "Our long-term strategy focuses on the strength of the entire Zune ecosystem across Microsoft platforms." 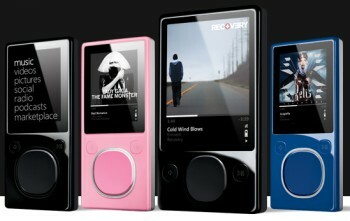 The company also announced that the Zune HD is now available in Canada through the Zune Originals store. Canada, however, appeared to be largely unaware of this development.